Gerald “Jerry” Lee Henre, 85, of Kansas City, Kansas passed away on April 12, 2019. He was born on August 10, 1933 to Ethel (Hageman) and Arthur Henre. He was preceded in death by his parents, and his brothers: Richard Henre and Marvin Henre. He is survived by his wife, Darlene Henre; Children: Joseph (Theresa) Henre, Marie Henre, Gerald (Katherine) Henre, Kandie (Michael) Panich, Melody Henre, Melinda Henre, Sherrie Henre, Lisa Henre, and John (Elizabeth) Henre all of the Greater Kansas City area; grandchildren: Carolyn, Patrick, Shane, Milan, Amanda, Chanse, Skylar, Amber, and Jake; great grandchildren Zoey, Sampson, Esther, Gwen, Sienna, and Amiliania; brother Steven and numerous nephews and nieces. 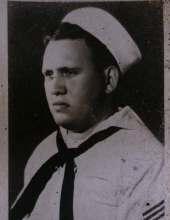 Jerry graduated from Wyandotte High School in 1952 and joined the United States Navy. He served valiantly in the Korean Conflict. After leaving the Navy, he married Darlene Dukovich and together they raised 9 children. Jerry worked for 32 years as a meat cutter for several local grocery stores. He earned a bachelor’s degree in Business Management from Rockhurst University. Jerry enjoyed woodworking, fishing, and spending time with his family. In lieu of flowers, the family recommends memorial donations be made to the Parkinson’s Foundation (See Link Below). To send flowers or a remembrance gift to the family of Jerry Lee Henre, please visit our Tribute Store. "Email Address" would like to share the life celebration of Jerry Lee Henre. Click on the "link" to go to share a favorite memory or leave a condolence message for the family.